The manager of funds for Quaker organizations and individuals reflects on Friends and the tension between money and ethics. 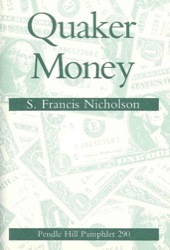 S. Francis Nicholson (1900-2005) was born in Baltimore, Maryland. During World War I he served with the American Friends Service Committee (AFSC), rebuilding houses in war-torn France. He later represented the AFSC at the World Conference of Friends in London in 1920. He graduated from Earlham College in 1921 and went on to Harvard Business School, where he graduated with distinction. He moved to Philadelphia upon graduation and almost immediately began dating Evelyn Haworth. The two married in 1925. With Evelyn, he pursued his avocations as a gardener, a pianist and a singer. Straight out of business school, he worked with Provident Investment Company, staying there for forty-two years. Working at Provident, he focused on minimizing risks by identifying more secure long-term investments. His concern for financial planning also led him to serve Media Meeting, Westtown School, the Friends Fiduciary Corporation, and the American Friends Service Committee. His Pendle Hill pamphlet, Quakers and Money, reflects his wisdom and spirit of service.